The core business sector of VIEROL AG is the Automotive Division. We are a specialist in international independent parts trade. Our replacement parts for cars and light trucks are available on the market under the VEMO, VAICO and ACKOJAP brand names. Our range encompasses over 43,000 automotive replacement parts. We cover numerous automotive brands and models. All three brands stand for high quality, in terms of both products and customer service. Our clients have high standards and specific requests. They expect high-quality automotive replacement parts and excellent service. We therefore look towards our business partners’ interests in all areas of our work. Long-term cooperation with suppliers and strict tests make it possible for us to consistently improve the quality of our products. Our competent customer service teams are available at all times. We are continuously working on new products to design simpler and more comfortable mobility in the future. The flat hierarchy of our family-owned and managed company makes it possible for us to quickly react to market changes. We therefore constantly offer our clients new smart repair sets and perfect alternatives to original manufacturer products. VEMO is the quality brand for high-quality electronic automotive replacement parts. With more than 15,000 VEMO replacement parts, we cover numerous models from European, American and Asian vehicle brands. We are particularly proud of our range of sensors and switches: VEMO offers more than 4,000 different replacement parts such as parking sensors, sensors for crankshafts and camshafts, air flow meters, steering column switches, thermal switches, and much more. Whether for sensors, switches, small engines, replacement parts for exhaust gas recirculation or products for inspection – VEMO offers the best quality. We are therefore the perfect alternative to the original part manufacturers. We offer smart repair kits in the Expert Kits+ section – from practitioners to practitioners – so that you can also save time. The Q+ seal identifies replacement parts with OEM quality, just like those made by the original equipment manufacturers. 15 experts work daily to ensure that the range is constantly extended and that the quality of VEMO products is continuously improved. Clients from numerous countries already trust us – get to know us too! The VAICO quality brand stands for high-quality automotive replacement parts. Our focus is therefore on the heart of the car: the engine and the transmission. As a specialist in the independent parts market, and one that is known worldwide, we offer an extensive of products, from suction modules to venting hoses and cylinder head covers. We cover more than 13,000 different vehicle models. Our VAICO replacement parts even cover 95 per cent of the German vehicle market. Whether transmission filters and sets, oil pans, or housing – VAICO offers the best quality products. Suitable transmission oil is also available, in addition to engine oil, antifreeze or additives. Our range has been bolstered by innovative repair sets from the Expert Kits+ selection. These kits include sets for changing oil, repair kits with hoses and venting valves or transverse control sets. The Q+ seal identifies replacement parts with OEM quality, just like those made by the original equipment manufacturers. Our competent expert team works everyday to optimise our VAICO automotive replacement parts and to extend our range. Our aim is to have satisfied customers all around the world. 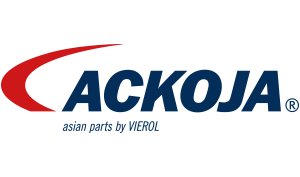 We distribute automotive replacement parts that are specially for Asian vehicles under the ACKOJA brand. Our ACKOJA replacement parts meet OEM quality standards. Around 150 oil filters, air filters, fuel filters and interior filters cover numerous Japanese and Korean vehicle models. We offer corrosion-resistant water pumps, precision timing belt sets and belt pulleys for the drive train and engine cooling. Our large range also covers high-quality replacement parts for the chassis and steering of numerous Asian vehicles. In addition to wheel bearing assemblies, it also covers bearings, control arms, supporting joints, shock absorbers and much more. The Expert Kits+ selection includes specially assembled repair kits. One example of this is our ACKOJA filter sets that feature all of the replacement parts required for inspection. Our specialists consistently check product quality. We continuously extend the range on the basis of market and trend analyses. ACKOJA therefore offers the perfect alternative to the original manufacturer, with the best quality. autoteile.de is the online catalogue and shop for automotive replacement parts from our quality brands VEMO, VAICO and ACKOJA. autoteile.de is a multifunctional order platform for our business partners: Upload your order list directly, check the prices and availability of our products and use it to contact us directly. You can find suitable products via the search and filter functions and see all relevant information such as vehicle applications or OEM numbers. We also offer 360° views of our products at autoteile.de and make available product and safety data sheets, as well as catalogues and advertising material. We publish on a regular basis interesting information and technical tips for our automotive replacement parts in our blog. We continuously present current highlights and new arrivals from our three quality brands VEMO, VAICO and ACKOJA on the homepage. Whether at Automechanika in Frankfurt or specialist trade fairs in the USA, Denmark or Poland – we are on the move around the world for our clients and business partners. We regularly present the technical highlights of our quality brands VEMO, VAICO and ACKOJA at international trade fairs.